Incat Tasmania is a manufacturer of high-speed craft (HSC) catamaran ferries. It has built smaller river and bay ferries over the years but it’s greatest success has been with large, seagoing passenger and vehicle ferries,. The company is based in Hobart, Tasmania, Australia and was founded by Bob Clifford. The company builds vessels using lightweight aluminium construction, twin wave-piercing hulls and water-jet propulsion. 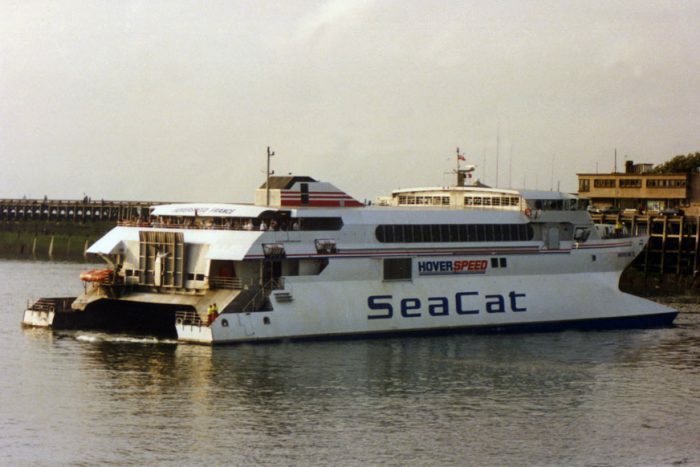 Numerous Incat vessels have operated across the channel since 1991 for Hoverspeed, SpeedFerries, Holyman Sally, Brittany Ferries, Condor Ferries and Stena Line. HSC Normandie Express, ex The Lynx, ex Incat Tasmania – Aluminium ‘Evolution 10B’ catamaran built in 2000 by Incat (International Catamarans) Australia Pty. Ltd, Hobart, Australia (Yard No. 057) as a car and passenger ferry. HSC Express I, ex KatExpress I, Norman Arrow, MGC 066 – Aluminium catamaran built in 2009 by Incat Tasmania Pty. Ltd, Hobart, Australia (Yard No. 066) for MCG Chartering Limited. Christened on December 24th 2008.